Naga is a animated short about a lively dragon that roams about the lands embracing it’s surroundings dearly. It discovered a barren land while out exploring and was saddened by the sight. After pondering for a while, it then realized it could revive the land with it’s ability to summon rain using its dragon ball. The short blends traditional animation and computer animation, where the look is similar to 2D animation but the character and a few environment elements are done in 3D. Software utilized to complete the short were Autodesk Maya, Adobe Photoshop, Clip Studio Paint, Adobe After Effects, and Adobe Premiere Pro. The short showcases a stylized Chinese traditional ink painting style, key frame animation, and particle effects. 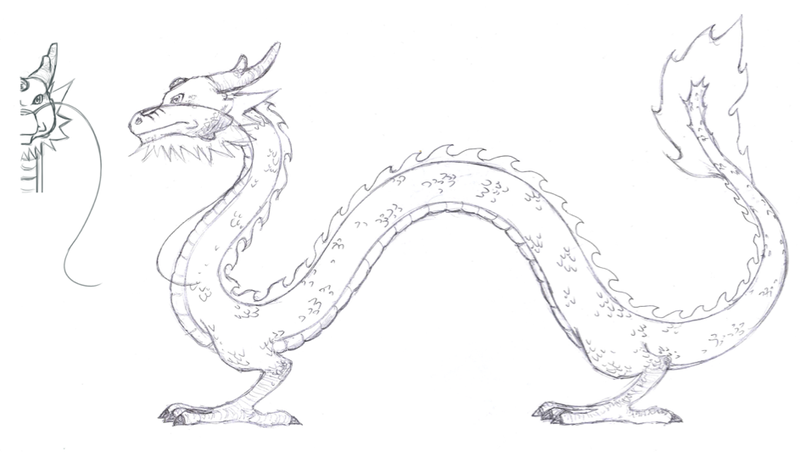 The main character of Naga is a dragon because I have always been fascinated by dragons since a young age. Dragons are also part of my Chinese heritage and are held in high esteem in my culture. Unlike western dragons who are often depicted as fire-breathing beasts to be conquered, in the east, dragons are celebrated as powerful, mysterious and noble creatures, and believed to bring abundance, prosperity, good fortune and divine protection (Origins). While going through some information on the internet, I came across an interesting theory about the number of toes on a dragon determined it’s origin. According to that theory, dragons from China have five toes and as we get further from China geographically, the number of toes the dragon decreases. As such, dragons from Korea will have four toes while dragons from Japan will have three toes. The dragon featured in Naga has four toes because symmetrical models are easier to make, and also because I referenced dragon illustrations by Chunjiang Fu from Origins of Chinese People and Customs. The plot for Naga was inspired by a segment in Disney’s Fantasia 2000, where they animated pictures to the 1919 version of Igor Stravinsky’s Firebird Suite. It was about a spring fairy and her companion elk who accidentally awakens the Firebird, a fiery spirit of destruction near a volcano, resulting in the devastation of the surrounding forest. Fortunately the spring fairy survives the ordeal and the elk encourages her to restore life to the forest. Another inspiration and reference for the short was a 1999 Hong Kong Drama titled Dragon Love, which was a story about a forbidden romance between a human and a dragon. The movements of the dragons while summoning rain in Dragon Love influenced how my dragon danced around it’s orb to summon rain. 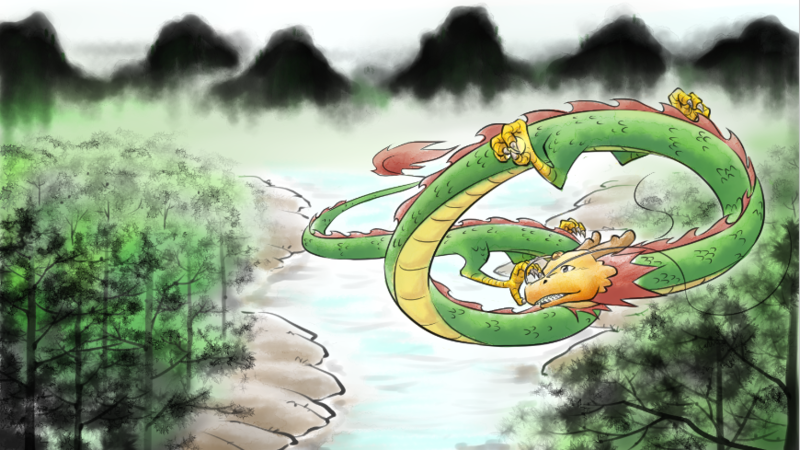 I also took inspiration from Chinese myths and legends about dragons forming the four great rivers in China.